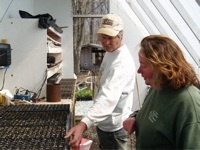 Alamance farmers Alex and Betsy Hitt look over seedlings in their greenhouse. Sheila Neal is as calm as a mother can be while her son Hank, an affable toddler, sends the last few carrots on his plate floorward. And she’s remarkably calm when you consider the pace she been keeping in preparation for the opening of the Carrboro Farmers’ Market. Neal, full-time market manager for three years, has been meeting with volunteers—there’s a roster of 20 this year—and getting the special events schedule finalized. Last week was full of the same, along with a string of meetings like a Thursday evening discussion with the market’s meat committee. Even though it’s the first market of the season, Neal said, there is going to be plenty waiting for the first round of customers. There’ll be greens and radishes and crops like collards and cabbage that have wintered over. Most of the vegetable action at the farms this time of year is taking place in hoop houses or greenhouses. “We’ll also have cheeses, meats and eggs,” Neal said. “And pecans,” she added after remembering that Alfred DeLahassaye of Sweetwater Pecan Orchard is bringing along some of his seven different pecan varieties. As for the rest of the season, Neal is looking forward to the return of the children’s seedling event. On Saturday, April 21 vendors are donating sungold and other cherry tomato plants to children interested in gardening. The kids will get some advice from the market’s cadre of master gardeners on planting and soil. The kids are then invited to bring their plants back after 10 to 12 weeks to have their portraits taken while they hold up the fruits of their efforts. “When we did this in 2005, we had 180 kids pick up seedlings and 30 of them came back to get their picture taken,” Neal said. “They were adorable.” As for the rest of the year, look for the return of the market’s trademark tomato tasting along with more events that pair local farmers and chefs to help people get some ideas in developing menus and working with some of the more exotic varieties to grace the market. While there’s plenty of activity in town, things are happening on a really big scale in the countryside. Visit Alex and Betsy Hitt in late summer and they might share a fatigue story or two of how the aches come on quicker than they did when the couple started Peregrine Farm in 1981 on a little piece of Alamance County a dozen or so miles from Carrboro. But now, especially after a good dousing last week kicked their plants into overdrive, the Hitts are in high spirits and ready for Saturday’s market opening. For Betsy it means more than being open for business for a long stretch of Saturdays. It means seeing people she hasn’t seen since last October. In peak season Peregrine Farm is very likely the most diverse and productive three and a half acres in the state. Last year, their innovations and careful development of different plants in conjunction with local restaurants and stores won them national honors. They represented the Southeast as one of four farms nationwide to win the annual Patrick Madden Award for Sustainable Agriculture by the Sustainable Agriculture and Research Education (SARE) program, a federal clearinghouse for best practices in sustainable agriculture. And while the workload of their on season could whither the hardiest of laborers, last year’s off season was pretty enviable. The couple were part of a large group from the Triangle to attend the annual Terre Madre Slow Food Conference in Turin, Italy. The Slow Food movement, which has a huge following among local chefs and small farmers, is aimed in part at restoring the connection between consumers and farmers. Other plants the Hitts have mastered and a quarter-acre plot with 10,000 head of lettuce is evidence of that. “Two–thirds of this is going to Weaver Street [Market],” Alex Hitt said as he adjusted the floating row cover, a gauze-like net that keeps tender crops from getting nailed by frost in the unpredictable spring weather. In the greenhouses, the Hitts look over the seedlings that are ready to fill in as crops in the field are harvested. “This is third week of April,” Alex Hitt said, pointing to one set of flats. “This over here is the first week of May.” The Hitts are longtime Farmers Market organizers and board members. Both remember the struggle to get the market built at its present site and both know the long process it took to get the market running as well as it is now. As for whether or not that means shoppers will get a chance at Peregrine produce come December, well, you might want to ask them about that in August.